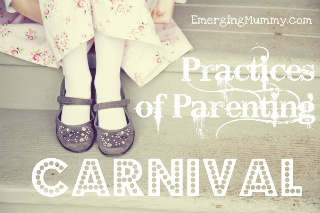 My friend, Sarah, a talented writer and aspiring author, is hosting a blog carnival this week on our practices of parenting. I've known Sarah for several years now, and am amazed at how her writing has developed over time. It won't be long until I'm referring to her as an accomplished author. Of that, I am sure. I strive hard to be the parent I long to have and to model for my children the child whom I'd like to see. In our house, the golden rule prevails. In our house, "Would you please go back and hang up your coat," is the phrase of choice. The pay-off is that all of my children, old and young, will come to me when they have problems instead of shutting me out. They trust me with their heart and will ask me to pray with them over fears and tough situations. As my children grow older, I find myself helping them to find themselves. I want to connect with my children long after they're children. I want them to know how to make good decisions. And I want to encourage them in the pursuit of their gifts and callings -- not my callings, and not my opinion of what their callings should be. I spend a lot of time discovering, nurturing, and even sharing their interests. I also go out of my way to ask for and value their opinions, even going with their opinions over mine on non-essentials. Right now I'm reading (and enjoying) all of the books in the Diary of a Wimpy Kid series. I read books I'd not ordinarily read simply so that we can discuss them -- Mrs. Frisby and the Rats of Nimh and a basketball novel titled, The Moves Make the Man instantly come to mind as examples. And most of all, I'm not afraid to admit my mistakes. If they feel I've wronged them, the door is always open for a calm discussion, and then either a clarification or an apology. Or sometimes both. My hope is that I'm building a foundation now for adult children with whom I will enjoy a lifelong mutually-respectful relationship. A relationship of love, connection, and togetherness. I envision my children as capable, responsible adults who boldly pursue the plans God has for them and who embrace the close relationship God wants with them. I'm far from perfect. Of that, I'm also sure. And I tell them that freely, so they know it's okay that they're not perfect either. in my practices of parenting.